Home › FAQs › Who needs portable scene lighting and for what? Who needs portable scene lighting and for what? To light his job site, James uses one of the smallest Lentry Lights to complete an evening remodel project (modern equivalent is model 1OPUPS). More photos of our lighting systems in action. True story. A Fire Department told us that their Lentry Light is perfect for leaving on-scene with their fire marshal for investigations. It quietly lights the whole scene and is small enough that the fire marshal can simply bring it back to the fire department in his car when he is finished. Previously, all the firefighters had to stay on scene until the truck lighting was no longer needed! Lighting a sledding hill with a Lentry Light. Lentry LED model 1STARX lights fire fighters during evening bailout training at our shop. Nothing makes you safer at night than seeing and be seen! 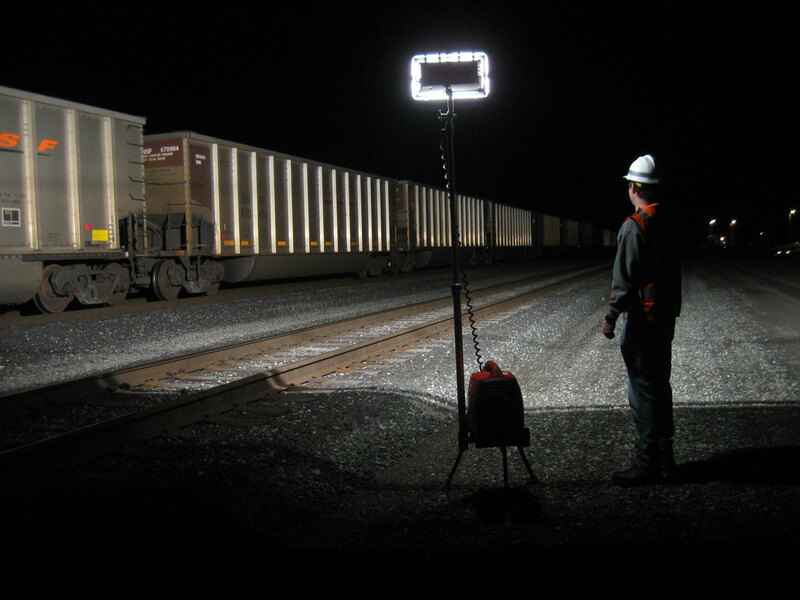 Lentry® Lights by Ventry Solutions, Inc. are a full line of portable, telescoping lights—also called light towers, generator lights, light plants—that provide temporary light to large, remote areas all night. No hassle. If flashlights are not enough and tow-behind trailer-mounted generator lights are too much, a Lentry Light may be just right! Invented for fire and rescue applications (emergency scenes, disaster response/relief...), Lentry Lights are now serving as portable, temporary, remote area safety lighting for many industries. We keep learning of more people who work and play outdoors at night and for whom Lentry Lights extend their hours of operation. The following list will grow as we hear from customers. Ken and James responded to an emergency call and found the fireboat battery dead! A Lentry Generator with Legs is used to recharge the battery so they were able to respond. True story. At an expo, a utility customer mentioned to us how helpful it was to them that their Lentry Light was so quiet. They could do their work in residential areas without drawing attention and were able to aim precisely, as needed, so as not to shine light into people’s homes. James stands next to the tracks at the railroad refueling depot during nighttime light testing. (Each railroad car is 50 feet long.) Click to enlarge in new window. Trench work (and pole work) is often mentioned by customers associated with water supply and treatment, telecommunications and utilities. Airports use our lighting systems during fueling of aircraft, luggage management, passenger boarding and deplaning, runway maintenance, and emergency response. Safety lighting for anyone who works outdoors in the dark. Flagger lighting and traffic safety at roadside incidents, construction, maintenance crews, and motor vehicle accident (MVAs) scenes. Team sporting events and practices including tracks, arenas, small fields, laser tag. Energy companies and utility crews after storms, for remote maintenance, and for nighttime and outages. Lentry Systems can light a scene and charge battery-powered suitcase-type lights at the same time. They often replace diesel-powered and gas-powered light towers. Landing zone lighting (prior to helicopter arrival). Be sure to follow local protocols. Hobbies - RC Aircraft enthusiasts use an EU1000i for remote power at airports. Amateur videographers keep one in the trunk for light on-the-spot when events take place at night. Quietly running in the background. Fish traps! Often caught in the dark, fish and wildlife crew use small, portable Lentry units to light the entire area, greatly increasing safety and the ease with which they can finish the job. Construction crews are able to work into the evening hours during winter (as shown in the photo gallery). Traffic Safety / MVA Scenes / Highway Scene Safety - Road crews and highway projects, especially for flagger safety! Wrecker service - used to light accidents and wrecks on the roadway as towing company/tow truck loads. Container Yard / Shipping Port / Seaport - Back up lighting in case of power outage. Safety lighting for highway flaggers, rescue personnel and recovery at accident scenes, traffic control lighting and more (extra tall XT models especially). Keep roadside workers safe and seen. Backup and emergency lighting for prisons and public facilities where power continuity and lighting is crucial. Large-scale emergency scene lighting, for example triage incidents, mass casualty scenes. Concrete pouring and finishing - 2-headed models and those with 2 separate telescoping lights can light up two nearby operations simultaneously, such as a concrete pour and the finishing. Portable Lentry Lights with 2-Headed Optup or 2-Headed V-Spec LEDs can aim at the base of a utility pole and the top at once. Arenas - A therapeutic riding center lights their arena with 1STARX so as to extend the hours of operation during short winter months. Boating - waterfront, dockside, at sea! Medical response tents/trailers - standby at special events use Lentry Lights because power and terrain are unpredictable.